As strange as it may feel to be celebrating Christmas in the sunshine, the festive season is a magical time of year in Cape Town. Although it’s peak season for holidaymakers the city never feels too crowded, and there’s always plenty to do – including carol singing in Kirstenbosch Botanical Gardens if you want to get into the Yuletide spirit. Here are some of our top recommendations for your villa holiday. 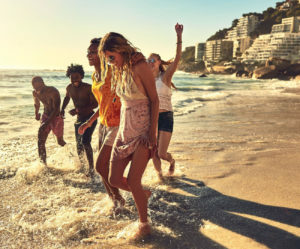 You’re spoiled for choice when it comes to picture-perfect beaches in Cape Town, with three Blue Flag beaches within easy reach of the city centre. Probably the most popular is Clifton, which consists of four coves separated by granite boulders that are accessed down fairly steep paths. 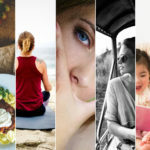 Each has a different vibe: generally speaking, First Beach is laid-back, Second is glamorous, Third popular with Cape Town’s gay community and Fourth popular with families – but wherever you end up, the atmosphere is friendly and relaxed. 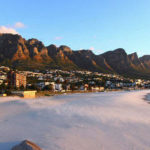 A little further along from Clifton is Camps Bay, a small white-sand cove with the Twelve Apostles mountain range as a backdrop. There’s a strip of glitzy restaurants and cocktail bars across the road from this beach, handy if you want to nip off for a spot of lunch or see the sun go down with a cocktail in your hand. 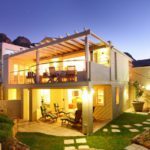 Further down the coast towards Hout Bay is Llandudno, an exclusive residential enclave with a picturesque beach popular with families and surfers. Arrive early as parking is limited, and bring a picnic with you as there are no shops or restaurants (although Camps Bay is only a 15-minute drive away). When it’s time for a break from the beach, head to the Victoria & Alfred Waterfront. Located in what is still a working harbour dating back to 1654, this popular retail and leisure complex houses a range of attractions. Victoria Wharf offers upscale shopping from local and international designer fashion to jewellery, leather goods and homewares, and also has restaurants and a cinema. For unique, hand-crafted items – which make great souvenirs or gifts – check out The Watershed next to the aquarium. Stop at the V&A Food Market for a casual snack or gourmet street food, or for something more substantial head for one of the many restaurants offering everything from sushi and fish and chips to Greek, Italian and vegan fare. 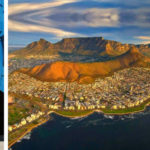 Other attractions include a Ferris wheel offering panoramic views of Cape Town and the world-class Two Oceans Aquarium, which explores the rich marine life found at the southern tip of Africa. From here, ferries depart for Robben Island, where Nelson Mandela and other political prisoners were famously imprisoned. Don’t miss the Waterfront’s newest addition, the Zeitz Museum of Contemporary Art Africa, which has been described as Africa’s answer to the Tate Modern. The building it’s set in – a converted grain silo restored and reinvented by the British architect Thomas Heatherwick – is as impressive as the artwork contained within. There is probably nowhere else in the world where you can dine so well for so little as Cape Town, thanks to South Africa’s favourable exchange rate and a raft of innovative chefs who have made the city home. Plan ahead to make sure you get a reservation for The Test Kitchen, which made it onto the list of the World’s 50 Best Restaurants in 2018. This fine dining establishment, with British-born Luke Dale Roberts at the helm, offers bold, inventive global cuisine with a South African twist. Casual sister restaurant The Pot Luck Club is the place for sharing plates that are equally as eclectic, with the menu divided into five flavour profiles: salty, sour, sweet, umami and bitter. Both restaurants are set in the vibrant Old Biscuit Mill in gentrifying Woodstock, which has a buzzing Saturday morning market popular with locals and visitors alike. Set at the top of the Constantia Valley – about 25 minutes’ drive from the Waterfront – Chef’s Warehouse at Beau Constantia offers a superlative ‘tapas for two’ menu of eight dishes over three courses that vary according to the season, accompanied by wines from Beau Constantia estate. Book a table on the veranda overlooking vineyards and distant mountains, but if the weather doesn’t cooperate (summer can be windy), floor-to-ceiling glass windows make the most of the view. Bree Street in the City Bowl has become a foodie destination in recent years, with a highlight being an outpost of Chef’s Warehouse called Chef’s Warehouse & Canteen. La Tete serves French bistro fare that espouses the nose-to-tail stance made famous by Fergus Henderson, helmed by a chef who worked at both St John Restaurant and J Sheekey’s, and Villa 47 combines Italian and Asian-inspired fare with a sleek cocktail bar. With such stunning scenery surrounding you, it makes sense to take a helicopter tour – and the adrenalin rush will leave you buzzing for days. 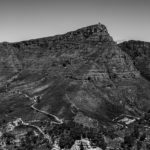 Cape Town Helicopters come highly rated for their professionalism and knowledgeable pilots, who provide informative commentary of what’s going on below. There are a number of different trips on offer but we recommend the Two Oceans, a 25-minute sweep along the Atlantic Coast to False Bay – you might even spot a whale or two. Gather a group of family or friends and book a luxury villa from Capsol. 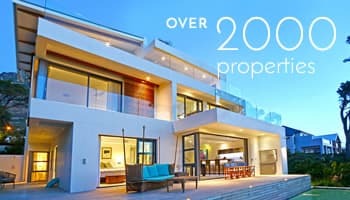 Overlooking Glen Beach in Camps Bay, 1 on Sedgmoor consists of two distinct buildings, one modern, one historic, each with bedrooms, dining areas and kitchens, allowing for plenty of privacy – but there’s also ample entertainment space and panoramic sea views from the patio and pool. There’s also a small flat around the back with a kitchenette, and the services of housekeeper and night guard are included. If you’re travelling with children, 19 on Blair in Camps Bay includes family-friendly facilities – such as a playroom and a trampoline – without compromising on style. This contemporary, recently-refurbished property has an open-plan kitchen, five double bedrooms, a large heated swimming pool and a terrace with a fire pit overlooking Glen Forest. In addition, find gym equipment, a home cinema and a spacious garden. Situated in Bantry Bay, the stylish enclave between Sea Point and Clifton, and only a five-minute drive to the beach, San Michele Views is a Mediterranean-style villa with three double bedrooms, a swimming pool and a jacuzzi. 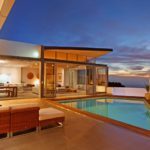 The panoramic ocean views from the deck, bedrooms and bathrooms are breath-taking. All Capsol’s villas come with state-of-the-art kitchens and expansive entertainment areas, so why not use the services of a private chef during your stay? We can arrange catering for any kind of event, from elaborate multi-course dinners to casual barbecues and drop-off dinners – we’ll even arrange to stock your kitchen with groceries before you arrive. Yacht charters are also available – how about a sunset cruise? – with onboard live music, canapes and drinks. If you’d like to keep to your fitness regime, one-to-one personal training sessions are available, along with the services of a babysitter/au pair, hair stylist and personal shopper. Get in touch with us to have a chat about your requirements. Danielle started at Capsol over 5 years ago and has worked her way from junior consultant to now being their top achiever. Her trust worthy recommendation and client centric service has been the corner stone of her success and this has accumulated into an extensive portfolio of repeat and referral clients. When Danielle is not taking exceptional care of her clients requirements, she is a loving mother to a busy 20 month old and dating wife to her gym bunny husband.